Age of Uprising: The Legend of Michael Kohlhaas makes strong use of its landscapes and features committed muddy production design work, but the story remains uninvolving and the normally reliable Mikkelsen is curiously inexpressive throughout. Directed by Arnaud des Pallieres, Age of Uprising: The Legend of Michael Kohlhaas is based on the 1811 novella by Heinrich von Kleist, which in turn was based on a true story. Set in early 19th century France, the film stars Mads Mikkelsen as Michael Kohlhaas, a peaceful horse trader and family man who's unjustly treated by a local Baron (Swann Arlaud) in the courts, following a dispute over two of his horses. When his loving wife Judith (Delphine Chuillot) is brutally murdered while on her way to plead her husband's cause to the ruling Princess of Angouleme (Roxanne Duran), Michael is forced to take action, so he sends their young daughter (Mélusine Mayance) away and sets about gathering a band of rebels (including a giant, played by Guillaume Delaunay, and Sergi Lopez as an arm-less Sancho Panza-like figure), Robin Hood-style. With his merry men in place, Kohlhaas begins a violent rebellion, beginning with a crossbow attack on the Baron's castle. The film is strikingly shot, with cinematographers Adrien Debackere and Jeanne Lapoirie making strong use of the rural landscapes, augmented by some impressively muddy production design and natural lighting (although that often results in the faces being too dark on screen). In addition, Mayance is excellent as Kohlhaas' young daughter, Lopez is good value as the garrulous armless man and Holy Motors' Denis Levant is excellent as a preacher who debates morality with Kohlhaas in one of the film's best scenes. 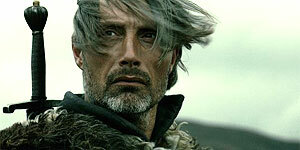 However, despite the strong premise, the film never really comes to life, largely due to a dull script and an uncharacteristically inexpressive performance from Mads Mikkelsen, all of which is frustrating because it's easy to see the film this could have been. On top of that, the film steers weirdly shy of onscreen violence and is further hampered by some distractingly jarring editing that seems to cut off several shots halfway through. Age of Uprising is ultimately something of a disappointment, thanks to a lifeless script and a lacklustre central performance from Mads Mikkelsen. It does have a good final shot though.